Please contact Annie if your questions is not shown below. Block Training Total Body Training system gives you purpose and will change your mindset. It is a well balanced range of exercises and at 3 times a week for just twenty minutes, a manageable, realistic and achievable goal for busy lifestyles. Block Training targets individual muscles and then integrates muscle groups as a whole, increasing the heart rate, thus burning more calories to achieve fat loss over the whole body for optimum results. Does Block Training work for men too? Annie has designed the Block Training Program for men and women who are fed up of fad diets and false promises. A Total body training system, to shape your best body ever. 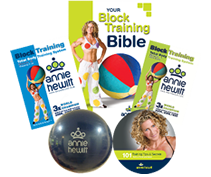 Whether you have never exercised before or have trouble getting motivated you will benefit from the Annie Hewitt Block Training system. Annie is passionate about providing people with a no-fuss simple workout and encourages you to make permanent changes to achieve a complete turnaround. By using the Block Training – Total Body Training System just 3 to 4 times per week and following a healthy eating plan you will create a new mindset within 21 days during this time you should ‘feel’ increased energy and more motivation. It is also at this time you should also “See” the results from your efforts.